It must be Colnago week for complex repairs. 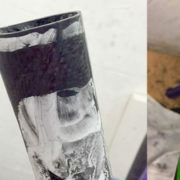 This frame suffered a massive head-on collision but after a full thermo scan we were able to confirm that only the head tube lugs and tube ends were damaged making it an economical repair. Lug bonded joints are always slighly more tricky to repair as you have 2 sets of repairs as opposed to only the tube intersections of a monocoque. We replaced and repaired the lugs in the traditional manner, rebonded and stress tested the frame slightly beyond the required pressures. Only once passed QC’d was it paint restored with particle specific Colnago metallic blue and flat white colours to finish the frame to perfection. Yet another would-be-trashed bike with a safe new lease of life.